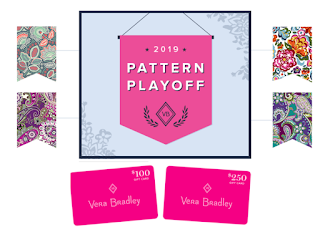 Vera Bradley Gift Card Giveaway - 15 Winners Win a $100 or $250 Gift Card. Enter Once Before 3/31 then enter again Between 4/3-4/7/19. Entry Period 2: Each Entry Period 2 Prize Winner will receive a $100 Vera Bradley Gift Card. Total of five (5) Entry Period 2 Prizes having a total approximate retail value of $500 will be awarded. Entry Period 3: Each Entry Period 3 Prize Winner will receive a $250 Vera Bradley Gift Card. Total of ten (10) Entry Period 3 Prizes having a total approximate retail value of $2,500 will be awarded.